"Do not underestimate the powers of the Emperor, or suffer your father's fate, you will." The dark side of the Force isn't any more powerful than the light side, but it is, as Yoda says, quicker, easier, and more seductive. And in X-Wing™, the dark side's seductive qualities follow largely from the sleek designs and fantastic maneuverability of the Empire's ships. 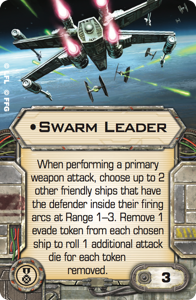 Whereas the pilots of the Rebellion—the heroes of the light side—fly ships that rely all too often on their shields, the Empire's black and grey fighters can dance about the battlefield with enough speed and agility to duck outside of enemy firing arcs and then dodge a turret shot or two. Imperial ships aren't necessarily stronger than their Rebel counterparts, but they have a lot to offer those pilots who look forward to dancing past enemy fire and exploding their enemies at close range. Similarly, they offer a multitude of riches to those squadron commanders willing to sacrifice waves of allied pilots in wars of attrition—wearing down the limited enemy forces with their seemingly unending swarms. Swarms. Fast and agile starfighters. Powerful weaponry—It's easy to be seduced the dark side of the Force, and it's easy to understand the Empire's appeal in X-Wing. 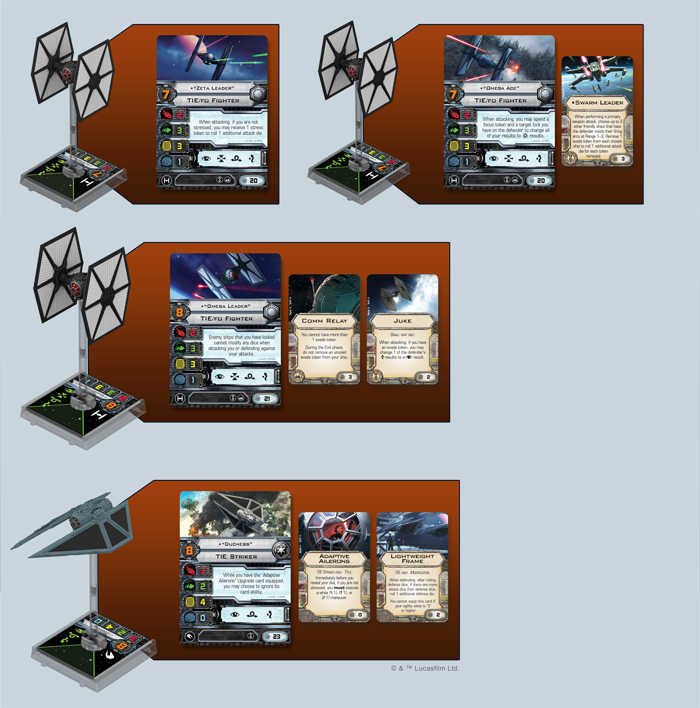 In our last X-Wing 101 article, guest writer Richard Greenaway shared the Rebel list that he's used to encourage his children's math skills and literacy, but that list represented only half of the squadrons he managed to assemble for under 101 USD. 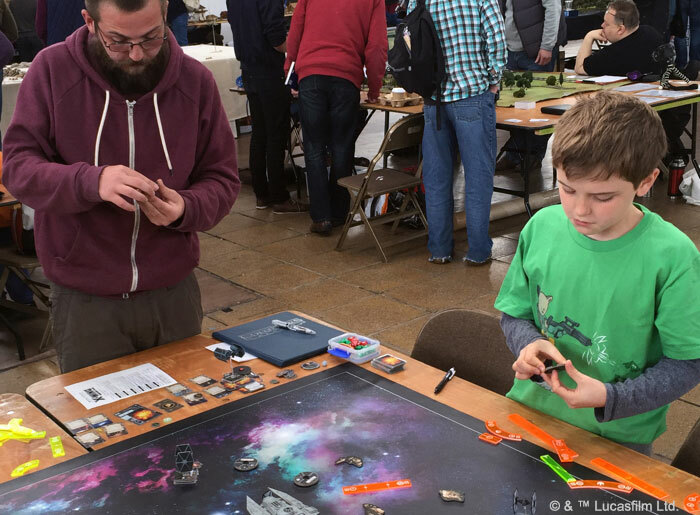 As a father and avid X-Wing fan, Richard snuck in a couple of Imperial expansions that would allow him to engage his sons in battles that could decide the fate of the Star Wars galaxy! After my previous article, it’s now time to explore a very different set of ships as we prepare to fight on the side of the Empire! The only problem with teaching younglings how to play this game is that they take all the best ships and upgrades for themselves. But parents, don’t despair! 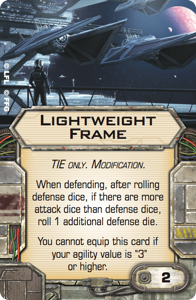 There are still enough ships left in the 101 USD budget to match the Rebel onslaught, and this list fits alongside the Rebel list from my last article in the sense that none of the ships, upgrades, or pilots are duplicated. You can build them both and fly them against each other. 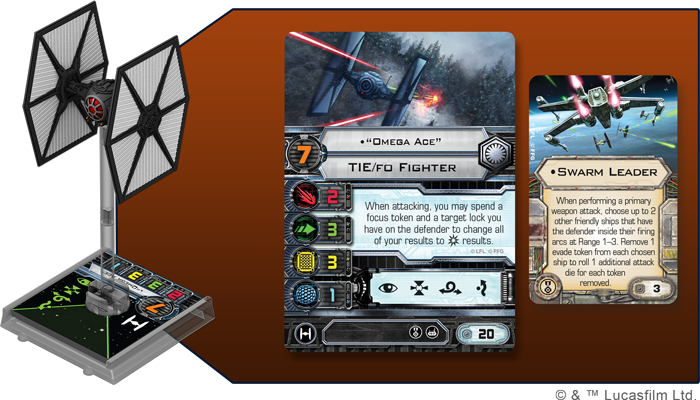 Again, we started with The Force Awakens™ Core Set and complemented it with the Rebel Aces Expansion Pack, TIE/fo Fighter Expansion Pack, and TIE Striker Expansion Pack. This gives us access to four TIEs. 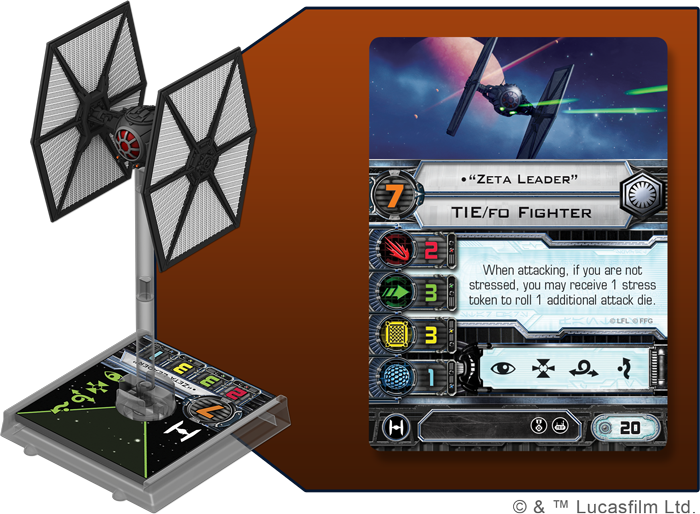 The Core Set comes with two TIE/fo fighters, the TIE/fo Fighter Expansion Pack gives us another, and the TIE Striker adds variety and unpredictability to our TIE squadron. Compared to the Rebel ships, our TIE fighters are considerably cheaper in squadon points, but they also have fewer shields. 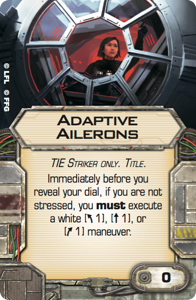 Also, since we don’t have many upgrade cards left to play with—as a couple of the stronger ones found their way into the Rebel list—we need to take advantage of the "built-in" abilities of our merciless aces to keep the Rebels at bay. Any Star Wars fan who watched the First Order TIE fighters chase the Millennium Falcon across Jakku will know how nimble these ships can be. And our collection of First Order aces allows us to make the best possible use of this speed and agility, as two of them get the most from the ship's limited firepower while the third is an intimidating and unshakable predator. 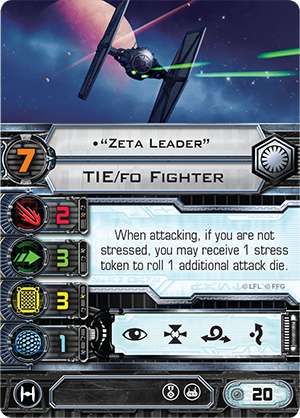 "Zeta Leader" has a fantastic ability that increases his ship’s primary attack value. If he doesn't have a stress token assigned to him, he can receive a stress to increase his attack from two dice to three—or up to four dice at Range "1." Just be sure to plot your approach with green maneuvers in mind so that you can get rid of that stress token as quickly as possible and increase his attack dice again and again. 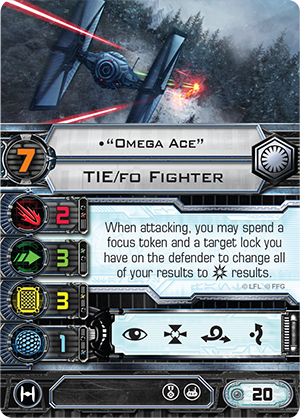 Our next ship, "Omega Ace," has the same pilot skill value as "Zeta Leader," and his pilot ability is also pretty nasty. If he has a focus token and a target lock on his target, he can spend both tokens to change all his attack dice to critical hits. It requires some setup, but the payoff is fantastic, especially since you can fire first with "Zeta Leader" and your other ships to strip the Rebels of their shields, and if one or two of your other ships still have evade tokens, you can spend them with Swarm Leader to add even more critical hits. If any of those critical hits go uncancelled, "Omega Ace" is going to cause your opponent a lot of problems. 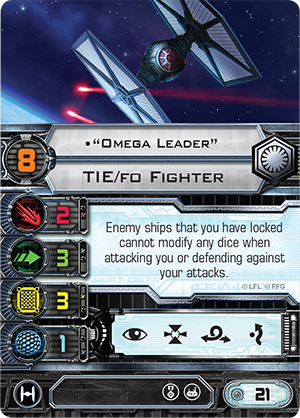 Our third pilot, "Omega Leader" is the ship to drive your opponent to distraction, and by combining two of our collection's remaining upgrades, we can transform him into a massive headache for the Rebels. 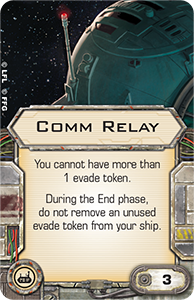 Comm Relay allows "Omega Leader" to hold one evade token past the end of your turn, keeping it with the ship. 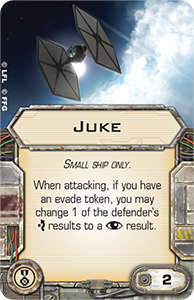 Then, as long as you don’t spend the token, you can use the elite pilot talent Juke to change one of your opponent’s green evade results back to a focus result. "Enemy ships that you have locked cannot modify any dice when attacking you or defending against your attacks." This ability stops your opponent from changing that focus back to an evade as long as you have an active target lock, and it also makes "Omega Leader" very hard in a one-on-one dogfight as his ability stops his enemy from converting focus results to hits when he's got that enemy locked. Finally, it’s time to look to the planet Scarif for our fourth and final ship—one of those amazing TIE Strikers that defended the planet against the troublesome Rebels in Rogue One. 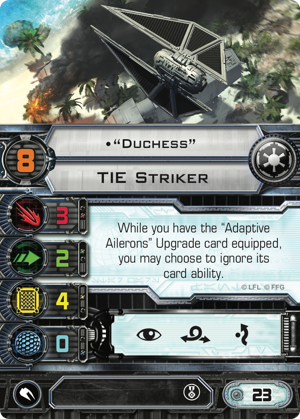 The most talented TIE Striker pilot available is "Duchess," and we’ve blown the rest of our squad point budget to recruit her. "Duchess" and her ship are unique in this list because they offer only two green defense dice rather than the three dice we get from the other TIEs. But that’s not the only way "Duchess" stands apart. We’ve also added a couple subtle upgrades to this ship that make it very unpredictable. First, the Adaptive Ailerons upgrade is free and grants "Duchess" a free boost left, right, or forward before she reveals her maneuver. Normally, this boost is mandatory, but "Duchess" can decide to switch it off. Just remember that this free boost doesn’t work if you’re stressed. Next, the Lightweight Frame modification is a useful two-point upgrade. It adds an extra green die to your defense whenever your opponent attacks you with three or more red dice. This modification and its green die could easily mean the difference between survival and defeat. In the end, we have four Imperial ships to pit against three Rebel aces. 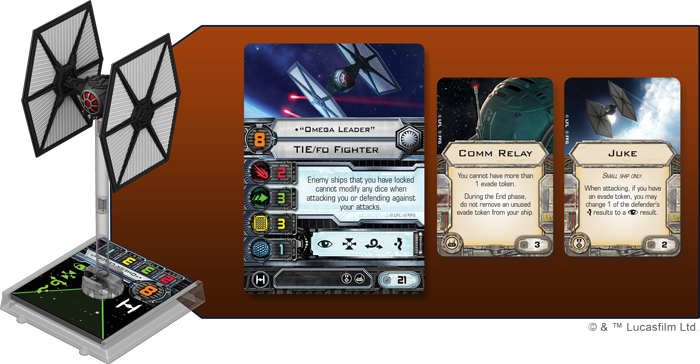 There’s enough flexibility within our 101 USD budget to enjoy an awesome X-Wing space battle. And once you’ve played these two lists against each other, you could consider swapping some of the upgrades around and seeing what impact the adjustments make. 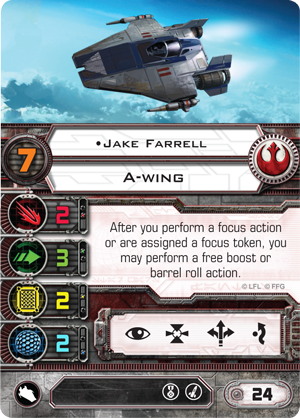 For example, you might give Juke to Jake Farrell and pit him against "Zeta Leader" with the Wired elite pilot talent. Also, once you fly one list against the other, you and your opponent can then swap over. There’s a real diversity of maneuver dials and abilities between the squadrons to challenge you and keep you interested. And even after you’ve learned how to pilot the ships, you will realize how ship setup, asteroid placement, and opening your moves can make a big difference in your initial engagement. Richard's son, Tim, fighting for freedom against an Imperial squadron! Finally, it's educational. At home, we’ve become quite stealthy at incorporating learning into games like X-Wing. In this article and the last, I’ve already addressed probability, math, and literacy, but the lessons the game can teach also include good sportsmanship and respect for your opponent—all of which can be taught over a three-foot by three-foot game mat!